Not everyone is lucky enough to get a hilarious sketch and an impression of themselves on NBC's Saturday Night Live, but Hillary Rodham Clinton has gotten lucky enough to have at least two brilliant women to portray her on the comedy series: Amy Poehler and Kate McKinnon. And now that Clinton is planning to announce her second presidential run on Sunday, soon our lives will be filled with Hillary impressions once again. That's why I thought it was time to compare Poehler's classic Hillary Clinton on SNL and McKinnon's impression, because each totally bring the funny to politics. Before Poehler admired Clinton as Leslie Knope on Parks and Recreation, the 43-year-old comedienne was known for her impersonation of Clinton throughout the 2008 election season (usually alongside Darrell Hammond's on-point Bill Clinton). Her impression even received high marks from Clinton herself in a SNL sketch "Message From Hillary Clinton" in 2008. "I simply adore Amy's impression of me," Clinton said in the segment, in which she and Poehler are identically dressed as, well, Hillary. 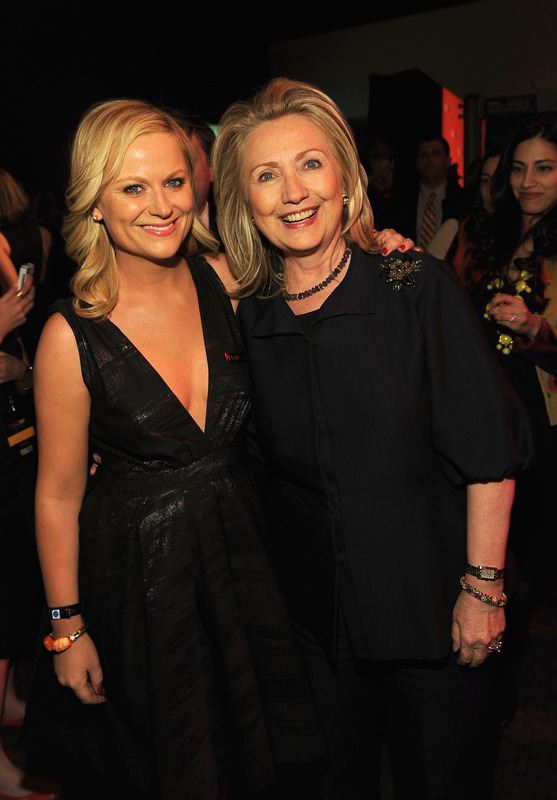 As Poehler laughed as her, Clinton remarked, "Do I really laugh like that?" Well, not everything can be completely perfect. Now with Hillary 2016 on the horizon, McKinnon needs to be ready to take center stage and continue to make viewers laugh as my favorite potential president. Here's how these two impressions compare to each other. Poehler and buddy Tina Fey's history of hilarity goes way further back than their three years of hosting the Golden Globe Awards together. Fey and Poehler have been friends for more than 20 years since their days at Chicago's ImprovOlympic, and frequently performed on SNL together — as Weekend Update co-anchors, as well as the very famous 2008 sketch in which Fey as Sarah Palin (then John McCain's running mate) and Poehler as Clinton made a joint appearance. In that all-too-real sketch, Poehler's Hillary shows enormous restraint as she stands next to Palin, and it's kind of how you'd imagine Clinton would be next to the Alaska governor. It's the height of Poehler's impression of Clinton, which portrayed a very uptight but composed and confident woman with that distinct laugh and impeccable pantsuits. The 31-year-old SNL cast member made viewers laugh hysterically in Saturday's parody of Clinton's 2016 campaign announcement via selfie video (above). Before that, McKinnon stepped into Clinton's shoes and pantsuit in 2013 for a parody of CNN's Piers Morgan Live about Hillary biopic movies and last month for a sketch about Clinton's personal e-mail controversy. Previously, McKinnon had been spot-on with impressions of Ann Romney, Justin Bieber, and Iggy Azalea. McKinnon's Hillary is just as confident as Poehler's, but a little less restrained with a laugh that borders on "mwahaha." There's no doubt that her Clinton impression wants to be president — or as she says in the sketch, "Citizens! You will elect me! I will be your leader!" Deadline Hollywood's Jeremy Gerard wrote, "McKinnon is so talented that by now she ought to bring more to her Hillary than generic, if Lady Macbeth-style, unbridled ambition." And with Clinton's announcement on Sunday, there will be plenty of opportunity for McKinnon to perfect her impersonation.